Two delicate roses nestle on a creamy ground. 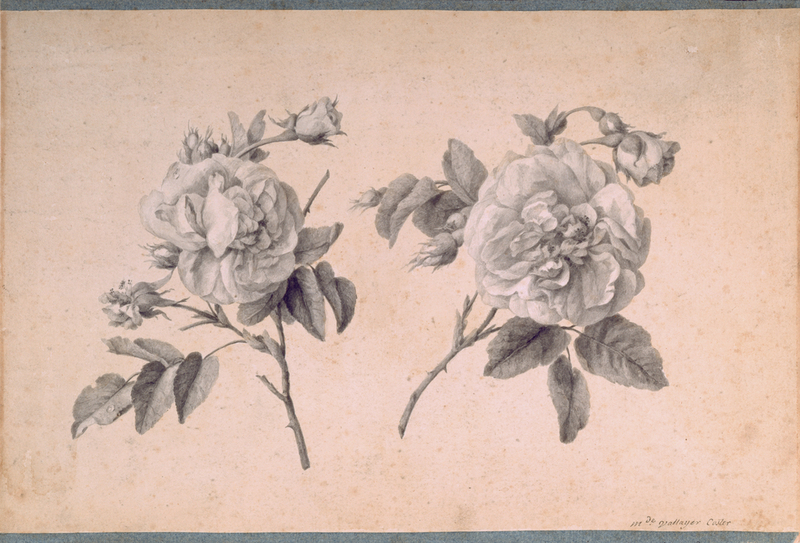 Although drawn in grisailles, a monochromatic pallet of grays and black, the flowers achieve an astonishing realism. Anne Vallayer-Coster was a master at painstakingly applying fine washes of ink with small brushes to create lifelike tones in her work. The artist’s sophisticated compositions attracted the patronage of Marie Antoinette. The queen was a great lover of flowers, particularly roses that were a traditional Hapsburg symbol, and until late in her reign was known to adorn herself with fresh blooms. Botanical motifs reflect the Enlightenment interest in the natural sciences and are deeply associated with the Rococo, a style which has aptly been described as the final flowering of the Baroque. This drawing imbues the precision of scientific illustration with a courtly elegance. Due to her great skill, Vallayer-Coster achieved an exceptionally high status for a female artist and, in 1770, was admitted to the Académie Royale de Peinture et de Sculpture. Her prolific output helped to elevate the prestige of the still life genre in France, and secured her place as a master of eighteenth-century naturalism.